This portable spy camera system built into a case that fits onto the iPhone 7 and produces incredibly high quality HD video (with audio). This is the perfect professional grade carry-anywhere covert camera unit whether you have an iPhone or not. 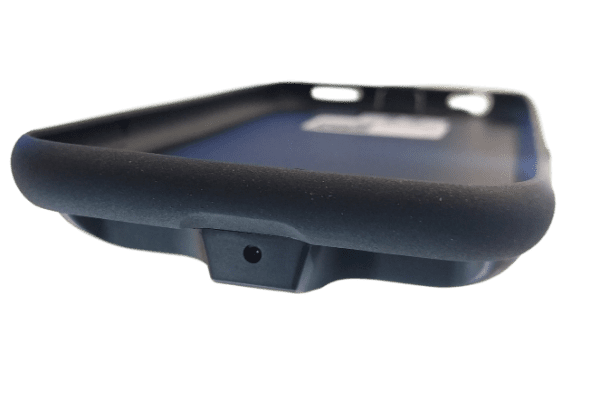 This specially manufactured cradle type case is designed to clip directly onto the back of an iPhone 7 making it an obvious choice as a portable surveillance camera system for a variety of surveillance scenarios. 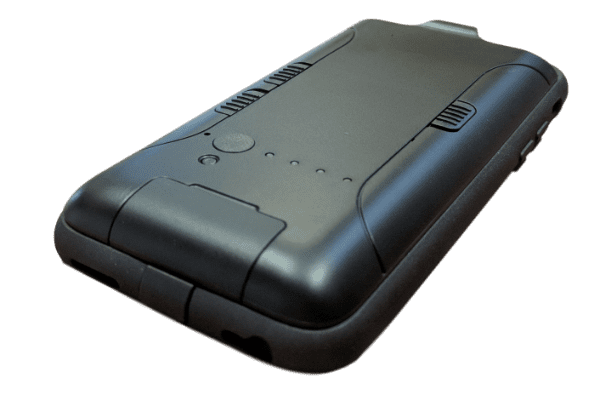 With almost everybody upgrading to a smartphone these days having a spy camera system that can attach discreetly to your smartphone has to be the best choice. Every normal phone that has a camera incorporated has the camera lens on the back face and some also have one on the front face of the phone. Clearly using the standard camera would be counter-covert as the phone has to be held in an unnatural position to obtain video footage using built-in systems. The iPhone 7 Charge Cradle Camera has the camera lens positioned in the top end of the case so that the phone can be held in a more natural horizontal position with the camera pointing at the subject without drawing attention. This camera and recording system in the cradle will work completely independently, this means that although the iPhone 7 fits perfectly in the cradle, it in no way interacts or requires any functionality from the iPhone itself. The result is a device that can be used with a ‘dummy iPhone 7’ for those who don’t normally use an iPhone (see drop-down menu) and/or a system that can be left alone, deployed maybe on a desk without the need to leave a mobile phone inserted. Even under close scrutiny this unit looks no different to a standard iPhone charging case. It records incredibly high grade colour 1080p video footage with time and date stamp (in Mov format) for evidential purposes and even has a simple slide switch to activate 4 x digitally zoom whilst still capturing footage – ideal for when you need to get close to the video subject-matter. On top of this the audio quality is very crisp with a decent pick up radius. The cradle is robust in construction and is very well designed with discreetly incorporated switches that are easy to understand use after a few trial runs. LED Lights showing function status can be set to off for covert operation. The charge/media offload port is cleverly hidden behind a removable cover as is the micro SD card slot. The system is designed to accept cards up to 128GB in size, with a 16GB card being supplied as standard with the unit. In addition to being able to record footage directly onto the memory card installed the device has inbuilt WiFi capability. This means that within the same WiFi transmission area ‘live’ footage of what the camera is seeing can be viewed remotely from an iPhone or an Android OS phone (app download required). In addition to remote viewing, recorded files/images can be downloaded and even the Cradle operating system settings can be changed from the smartphone app very easily. battery life with no WiFi or LED’s switched on is a very respectable 180 minutes or when switched on 120 minutes (after a full battery charge). Whereabouts is the camera located on the cradle? If you think of holding the phone in a normal manner, then the camera is located on the top end of the phone nearest the user, which means that it would need to be held in a position wit this end pointing towards the subject matter. Can what the camera is seeing be viewed on the iPhone screen? No, the iPhone that is being used in conjunction with the camera system will work totally independently. This means that the addition of the camera unit will not restrict phone usage in any way. Does the phone make any noise when recording are started and stopped or when the battery runs out? The iPhone Charge Cradle Camera gives no audible alerts whatsoever, so there is nothing that will alert unwanted attention. Is there another camera on the back of the cradle/case? No, but the iPhone that the system has been attached to can be used in the normal way and this includes the built-in camera because there is a hole in the back cover to allow for this. Who would use such a device? These units are very popular with Private Investigators who want a reliable high quality portable unit for a multitude of situations. Yes, the iPhone 7 Charge Cradle Camera has an in-built microphone that will easily capture and record clear audio onto the video footage up to a 6 metres radius. You will need access to a Windows or Mac computer with speakers attached is required if wishing to playback recordings with the audio. 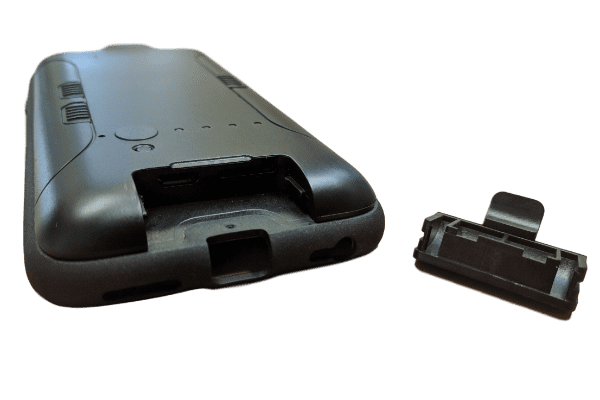 This product is NOT supplied with an iPhone 7 and although you will not require one to make the product function, it maybe worth considering obtaining a dummy handset to complete the disguise. We have an option on the dropdown menu.